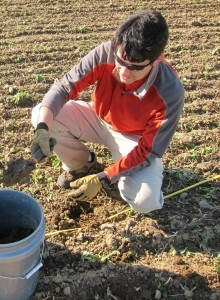 Sean Berthrong is a microbial ecologist. He completed his Ph.D. work at Duke University. Since December of 2009, he has been a postdoctoral associate at Cornell University. In 2012, he received a postdoctoral fellowship from the USDA to study how different types of agricultural practices affect soil bacterial and fungal communities and what those communities mean for sustainable agriculture. At Grice, he is working with Dr. Craig Plante continuing his work on agricultural microbiology, as well as mentoring students at the lab. Sean hopes to develop new methods for next generation DNA sequencing that will produce much more in depth insights into the world of soil microbes. This kind of work will benefit US agriculture and potentially reduce the harmful effects that agriculture can have on rivers and coastal ecosystems.